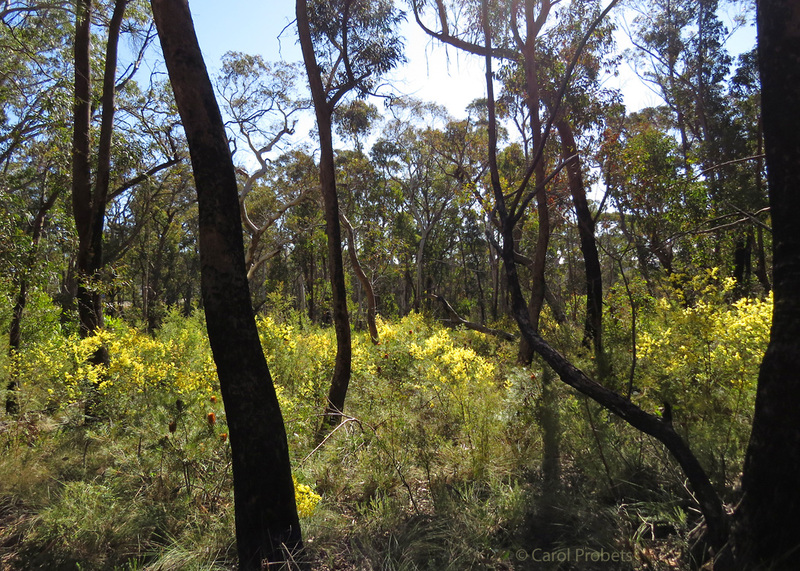 In June and July when the days are short and the air has a frosty bite, the Blue Mountains bush erupts in a spectacle of golden yellow sprinkled through the understorey like splashes of sunshine. 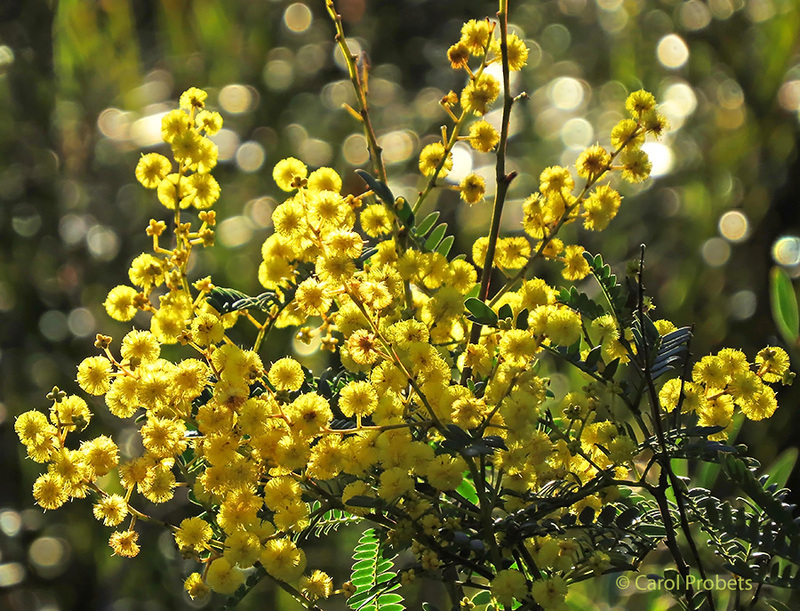 It’s the aptly-named Sunshine Wattle (Acacia terminalis), brightening our lives as if it knows just when we need it. Soon this is followed by the Sydney Golden Wattle, Acacia longifolia, then Acacia rubida, echinula, decurrens and many more. Wattles, as Australian Acacias are commonly known, are part of our Aussie identity. We’ve celebrated Wattle Day for well over a century, our national floral emblem is the Golden Wattle (Acacia pycnantha), and the national colours of green and gold worn by Australian sports teams are inspired by the colours of wattle. Few Australians don’t recognise the fluffy golden balls of the bush. Australia might be known as the land of the gum tree, but it could equally be the land of the wattle. Forests and woodlands dominated by Acacia cover 9.8 million hectares of the continent, second only to eucalypt-dominated forests which cover 92 million hectares (source: ABARES 2017), an area which has rapidly dwindled in the past 200 years. However, these figures don’t convey the true importance of wattles in the landscape. Eucalypt forests and woodlands often have wattles as understorey shrubs. In addition, there are species of Acacia that thrive in the arid interior where it’s too dry for eucalypts. Mulga, gidgee, myall, cooba, dead finish, pindan and brigalow, iconic trees and shrubs of the outback, are all Acacias. There are few parts of Australia where wattles don’t grow, and their flowering seasons span all parts of the year. There’s always a wattle in flower somewhere. And if you’re sneezing it’s almost certainly caused by something else. Wattle’s reputation as a cause of hayfever is undeserved and unfair. Wattles are pollinated by insects and birds; its pollen is relatively large and heavy. It’s not designed to float on the wind so it’s unlikely to irritate your nose, eyes or throat. 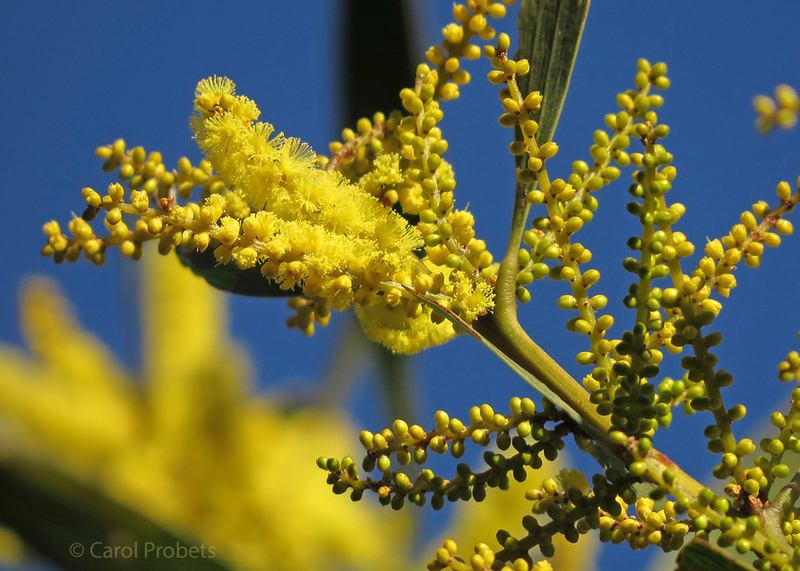 The hayfever that makes you miserable when wattle is flowering is much more likely to be caused by plants with less noticeable flowers, such as grasses, certain weeds and wind-pollinated trees. If you don’t believe me, read this from the Australasian Society of Clinical Immunology and Allergy. 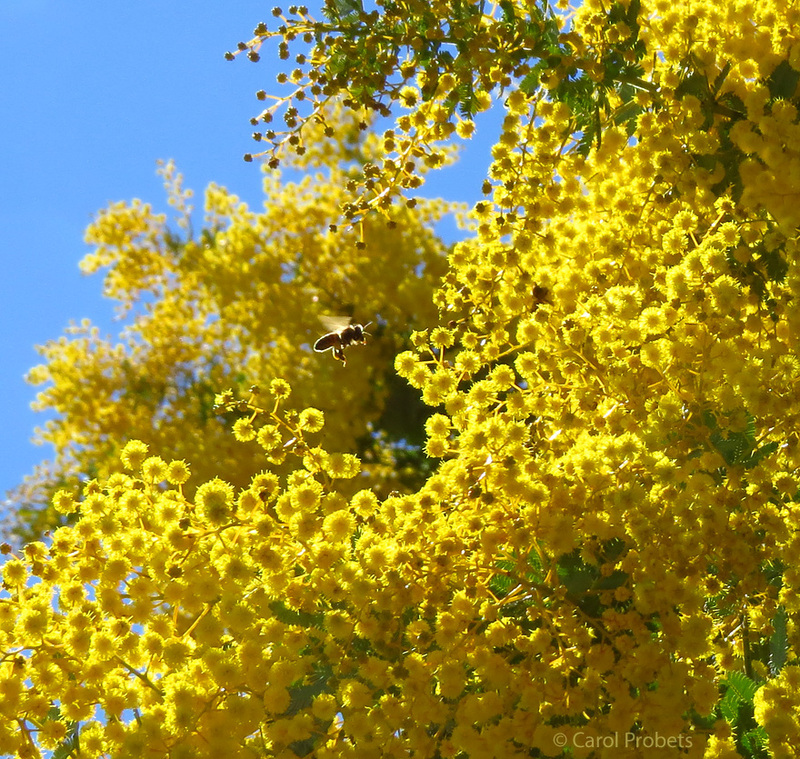 Wattle Day is usually celebrated on 1st September, but for many years there were two Wattle Days, with 1st August being the tradition in NSW where earlier-flowering species can be so conspicuous. It wasn’t until 1992 that unity was restored and National Wattle Day was officially declared to be 1st September, a date that also marks the first day of spring. Personally, I’d be happy to celebrate wattle every day of the year. 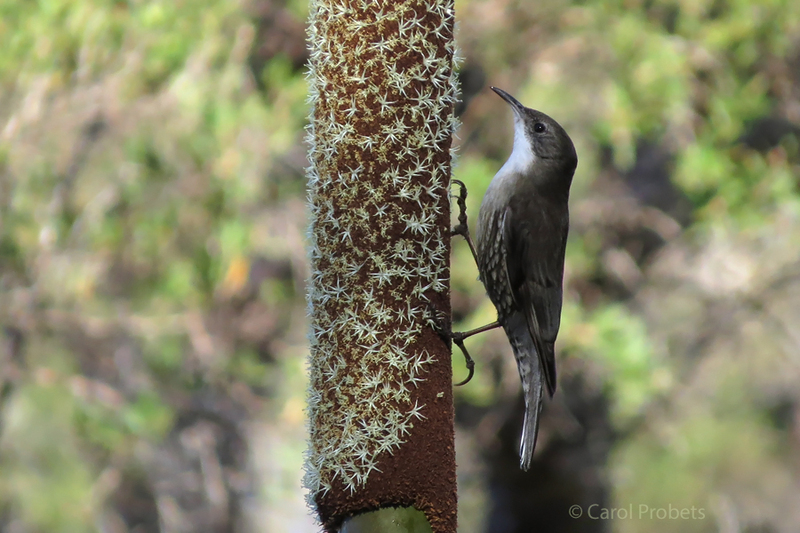 White-throated Treecreeper, Cormobates leucophaea. Click to enlarge. Time has slipped away and I realise it’s eight weeks since my last post. Be assured this is not due to apathy, but a combination of circumstances including the hospitalisation of a close, elderly family member, not having ready access to my books and photo files (for reasons too complicated to explain here), and juggling the additional responsibilities with tours and blocks of field work, preparing presentations, and all the extra travelling. As soon as things settle down again I’ll be writing and posting more often, including some of the topics I’ve previously promised to follow through on (I still haven’t forgotten those Western Australian orchids!). I have other half-finished articles mostly written in cafés on my laptop, just waiting for a final fact-check, edit and photos. Like a Wandering Albatross egg, they’re having a long incubation! Omphalotus nidiformis at twilight. Click to enlarge. The rain has washed away the stifling summer heat. Everything’s glistening and frogs are moving around, finding new habitat. The other day, as I walked along a quiet residential street in the Blue Mountains, I noticed a rather winsome frog sitting on the road. By lucky coincidence I had my camera with me. If anyone was watching through their window I don’t know what they must have thought, but you can’t get a ground-level photo of a frog without lying flat on the ground. Why do some currawongs have striped tails? Every year around January or February, someone usually asks me about a strange currawong they saw with a striped tail. If you’re familiar with currawongs you’ll know they don’t normally have stripes or spots down the tail, in the way that cuckoos and kookaburras do. So what’s the story with the ones that appear in summer, tail all stripy like the bird in the photo below? The explanation is quite simple. 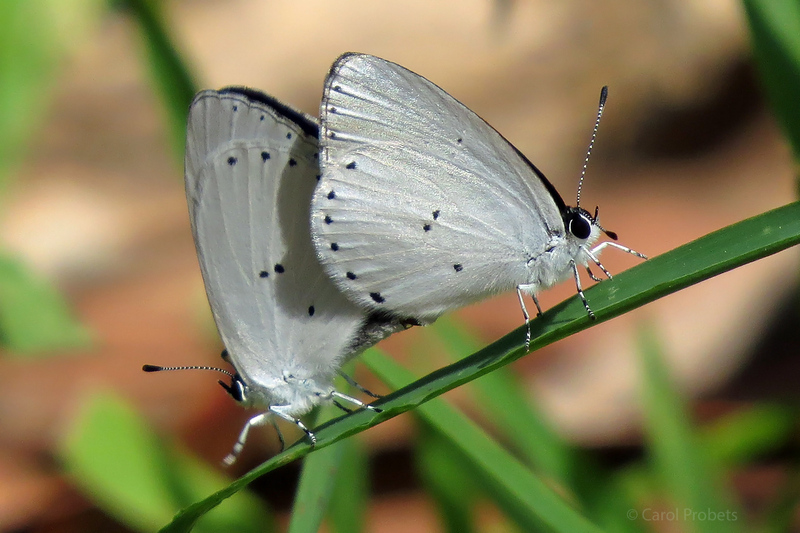 Candalides xanthospilos (Yellow-spotted Blue). Click to enlarge. 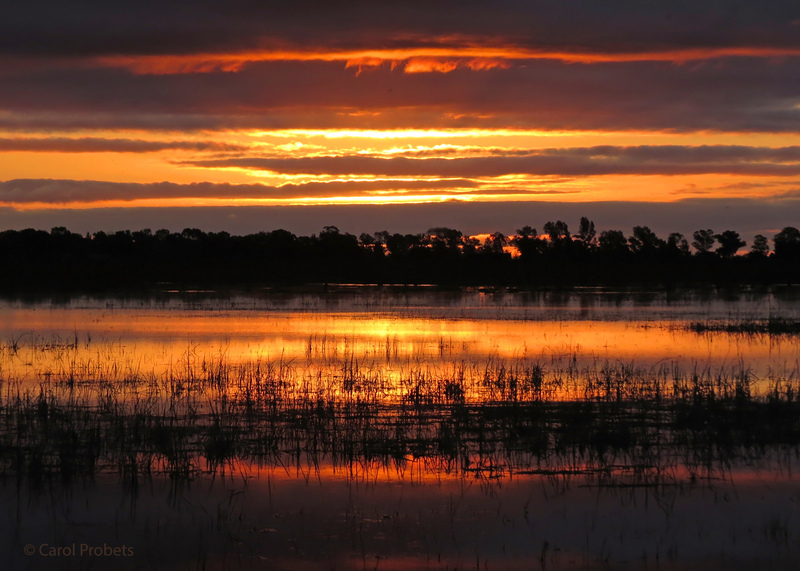 When I visited a farm in November to survey the birdlife, I expected a tranquil afternoon in nature. But nature had other ideas. Spring is a season of intense activity — not only for our fauna and flora but for me, as this is when I’m busiest leading tours, walks, and carrying out bird surveys. It’s frustrating that the season when I have least time to write is the very time there’s the most to write about. On the plus side, I’m outside seeing it all first hand! I’ll try to make up for my recent lack of posts with plenty of summer offerings, including looks at some of the interesting things I’ve seen during the past three months. It hasn’t been hard to find birds nesting and feeding young. For many species this continues into the summer months. Australian birds tend to have long nesting seasons (and smaller clutch sizes) compared to cooler-climate northern hemisphere species (see Ford 1989). This allows them to raise two and sometimes more broods, or at least have another try if the first one fails — which happens often. A nest success rate of less than 50% is not uncommon among small birds. This might be due to predation of the eggs or young, parasitism by cuckoos, an unexpected shortage of food, severe weather, bushfire or human interference. It’s amazing small birds manage to reproduce at all when you think of the many dangers they face. Australian Painted Lady (Vanessa kershawi), also known as the Blue-spotted Painted Lady. Wingspan approx. 5 cm (2 inches). An unexpected encounter this week illustrated nature’s brutality in vivid detail. I acknowledge the Gundungurra, Darug and Wiradjuri people and other traditional custodians of all the lands on which I walk and live, and pay respect to Elders past and present. 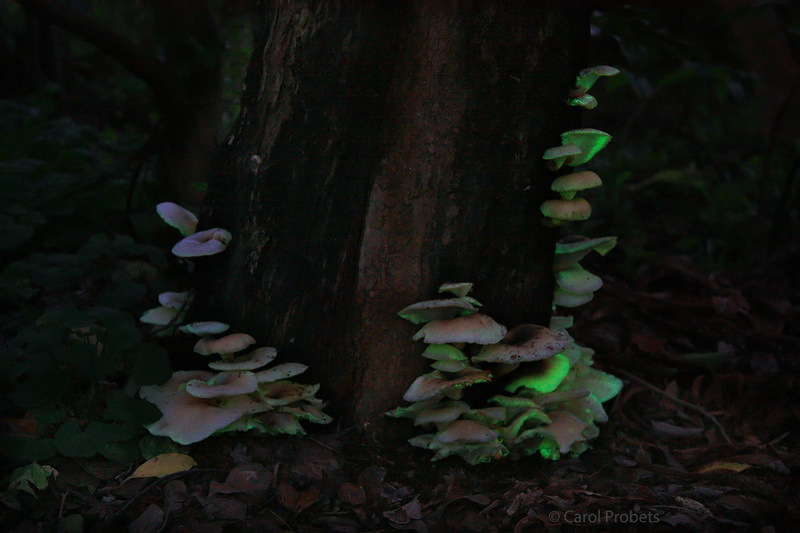 All photos in this blog, unless credited otherwise, are copyright © Carol Probets. Please contact me if you wish to use any of the photos for any purpose. Thank you for respecting my work.